I've been lurking this site for quite some time and decided finally to register and introduce myself. I'm from Taiwan and had only discovered Yuki Kajiura's music last year through the ending songs of Kara no kyoukai; ever since I fell in love with her music and during my search of her other works it led me to this site :) Really appreciate the people who organized her discography and translated the lyrics. Even though I'm gonna regret forever not attending any Kalafina lives, I'm glad that I at least attended the Yuki Kajiura vol. 14 a month ago. It felt just amazing being swept into her world and I was just overwhelmed by the range of emotions present in Kajiura's songs. Some songs are sincere that touches your heart, some epic enough to be the bgm of the holy grail war. Moving on, as a piano player, I naturally felt the tendency to explore Kajiura's music deeper than only listening to them. Which is why I started analyzing her music by creating piano covers. So far I've only arranged two songs, and if you're interested be sure to check out far on the water which I did recently and Kagayaku sora no shijima ni wa. Any feedback is appreciated and please tell me what you think! Anyway, that was my introduction. Let us continue worship Yuki Kajiura! Some parts the lowest note isn't the original bassline, but I guess that can't be avoided in order to play the whole harmony/counterpoint. Looking forward to another YK cover. Thanks, really glad that someone appreciates them! Definitely agree that the bass line is important and will pay more attention to it next time. Thanks for the feedback, it’s really helpful for a newbie like me. And thanks for welcoming me Himewakana. Nice to meet you too! Excellent piano playing and scoring. Kajiura songs always utilize key changes and relationships in interesting and metaphorical ways, as I’ve attempted to dissect on before. Far on the Water is another song that utilizes the music to express a concept through not just the lyrics but beneath all of that, the key progressions and melodies, kind of like the shape of the course/circuit the ‘vehicle’ of the melody will go down, carrying the lyrics on it. I’m cross-comparing the lyric, the performance, and the score you wrote (very nicely i might add), and I’ll try and explain the key relationships here both bit by bit, and then overall to tie it up in a neat little knot. The first musical phrase after this intro part moves in F# minor with the motif beginning on the pickup to measure 18, the section transitioning (B as I’ll call it) between the Opening (A), and (C) - C being the A major part you focused on. This F minor is an important transition because it expression the trepidation and anxiety of entering the boat, beginning the first ‘wave’ or ‘ripples’ in the water with the metaphorical paddle. We are moving from ‘unreliable radiance’ into the yearning for our (that one) future, this is important as minor moves into major, from trepidation to confidence. F sharp minor is the natural minor state F# occurring within D major, so this is a natural trepidation, and fitting. But quickly is overturned into the precondition for Aflat major, the key of the setting out towards the ‘yearning’ for the future, the overturning of the trepidation if you will. [Aflat Major] - within this section we have more trepidation expressed as D natural often appears which leads/portends into C minor, the relative minor of Aflat Major (G major being the V for C minor in the so-called melodic minor), but then jumps back to the initial uplifting ‘adventure start’ theme that characterizes this Aflat section, so it demonstrates a sort of ‘vacillation’ on the part of the character who isn’t sure of their destination yet. At measure 48 the song moves into the ethereal range one octave up, implying the rarified and exalted feeling of finally being ‘far on the water’ - or the liminal point of being off the shore but not yet at the final destination - and so the mystical kajiurago lyrics come up to portray this mysterious yet exalted idea, being carried off to their destination by fate or what have you. At measure 55 the song moves into F flat major - a theoretical key which is rarely used because it can more simply be notated as E major, which we can interpret as the turning point of the song from the liminal phase back into the strident A major phase which carries on again at measure 59-62, implying that the F flat major was a extended tonal variation within A flat major (or an arc if you will, which you depict nicely with arpeggiations), and then landing back at home key of D major. Here at measure 62 we have a recapitulation of the intro. melody/setting off theme, but re-arranged to be a resting place for that theme, in other words a reflection of the original theme in order to put it to rest, or looking fondly back on it with the confidence endowed from the journey of the Amajor section. I can say this is implied not just by the slower, more serene tempo, but because more major chords are borrowed into this section from F sharp major, rather than falling back into F sharp minor as they did at the start. Measure 72-75 depicts a a descending line that implies a relaxation of tension/coming down off of an anxiety and may be a sort of word-painting to reflect the new-found ideas gleaned from their moving ‘onto the water’. As you can see, there is a prolonged resting on F sharp major at measure 85-88 before moving into the next section. This part of the song has references to C minor like before, as well as Cmajor which is considered the cardinal key, the most basic key with no sharps/flats, which reinforces the message of ‘understanding the whole story’ and ‘settling in’ - you can see this continuously in say M. 92, M. 100, the vacillation between implying C minor/major here as discussed in the earlier part of the song with F# makes more sense now in context of the brief slower intro which is a very comforting “coming to peace” moment - an example of tone painting. At measure 114 we are moving into the final ‘cadenza’ section which contains harmonic anomalies to lead us to the conclusion, which again will be in Aflat Major. This brief intro to the cadenza from 114 -> 119 is in Fflat Major once again, which is a bit of a reference to the excited arpeggiated section in Part 2(outline above), but quickly leads us to relax in the serene state in Aflat Major again, rather than going back to D major. I believe this ending signifies the ‘handing off’ of the theme to the listener from the singer, who did not return to their starting place but were carried into the serenity ‘beyond the dark ocean’ as the continuation of their journey; if they had returned to D major the song would ultimately be meaningless. They have handed off this message to the listener/audience. They wanted to display the heights of the serenity waiting for them, thus the brief call to Fflat major/E major, before returning the substrata of Aflat Major. Now you are probably wondering why this all relates to D major and how so? A common type of cadence you found in court music of the 17th century in Italy was called the Neopolitan Sixth or ‘flat 2nd’ in practice, to force a major-major cadence to create a more uplifting sounding cadence when one wouldn’t normally be possible, or to modulate more smoothly. For instance D major authentic cadence progression might often be like this, in chords: DMajor - G Major - A Major - D Major. But to force a cadence to match you can lower the E to E-flat (or practically speaking D #) and ‘force’ a major chord into a cadence such as “D Major - D sharp major/E flat major - A Major, D major’. This isn’t normally called a key change but just a tonal borrowing, or variation such as when in say A minor, the E chord is major in order to give a ‘alternate color’ to the major cadence of a-E-A. In other words its a coloration but it has harmonic implications. This song can thus be seen in two different ways - as either being grounded in D major or A flat major, and thus moving from its ground or moving away from its ground, or as being a progression from D to A flat through various transformations. Arguably either is accurate, but I’ll explain why the key choice is not random. 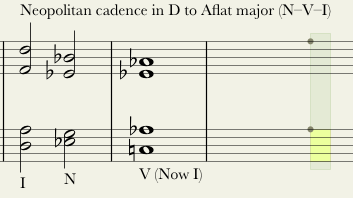 It can’t be the case that D major is being used as a plagal cadence to end up in Aflat Major, since Dflat rather than D is native to Aflat major. It also can’t be that the Aflat major is meant as a backward reference to the authentic cadence to return to D, since A natural is native to D major rather than A flat. Also taking into considering how the story is about departing onto the water and achieving or finding a sort of brilliance or serenity, neither of those explanations is sufficient. So idea #1: The Neopolitan chord for D major is E flat major - created by diminishing the E minor to E Flat Major. If you use this diminished chord to then transition to A major, you have a very natural sounding modulation which comes about unexpectedly. the problem with this is the lack of Eflat major chords in this piece. So I scratch my head wondering how to draw the conclusion from D to Aflat. Firstly E flat is the Vth or Dominant of A flat major, meaning the most crucial chord for resolving progressions in the key of Aflat Major, as V - I is the standard progression of western music theory. So in a sense, E flat is in fact implied as a chord missing between D and A flat major as a natural modulation crux somewhere along the line. Well it also happens to be that the Neo. chord for this missing key of Eflat Major is in fact F flat major, or in other words E major enharmonically speaking. This F flat major appears as a crucial key change, as mentioned earlier, around measure 55 during the liminal phase of the song, heading from dark into light/dusk to dawn/asleep to awake. The Fflat Major section appears immediately following the Aflat major section at measure 54, and also resolves back to it in measure 59. F flat major is also modulated to in the final cadenza section in part 5. in the outline above, in measure 115 and back again to Aflat. If D is the cardinal ‘starting point’ and Aflat is the goal, you must then construct a ‘musical path’ to get from one place to the next. I hope my key here helps to guide how this was done. Now yes the song is a pop song and not a ’symphonic poem’ so in fact it may be formulaic, but therein lies the genius of meshing a catchy and memorable tune with a more profound progression. Sorry if this is really long but its actually a project I’ve had on the backburner in my mind for months. Hmmm this is interesting. Gonna try to wrap my head around your post, lol. Really interesting musical analysis and interpretation; I never thought that this amount of analysis can be written for a song that is only 4 and a half minutes. Personally I never had serious training in music theory, so it took quite a bit of time understanding especially the 2nd part XD; but it provided me a more well-rounded view of this song. (I think you meant E flat major chords based on the context) as E flat major chords are everywhere (like in M36, M45, M96, etc.) and are used indeed to form a perfect cadence to A flat major. So I think I might have misunderstood something here. I really enjoyed your interpretation of the song - how it's describing the singers entering a boat, and within the anxiety accompanied by beginning a new journey, they transition to F sharp major with confidence. With confidence anew, the theme in A flat major has a renewed sense of urgency - through the new rhythm of 16th notes in the left hand - and at measure 48, they have arrived at a liminality far on the water - not yet at the destination but already far from their home. I was actually wondering while I was arranging whether or not to move the melody up an octave; and it seems like I made the right choice as now it seems that they are even further away/higher up from their starting point. Onwards, they express to the listeners their abstract/theoretical dreams of reaching further heights through the theoretical key of F flat major before returning back to the reality of A flat major. In this context, it completely makes sense that Kajiura-san deliberately to end on A flat major so that the listeners can follow in the singer's footsteps. Sorry I was just rephrasing what you said, but rewriting it makes me understand it clearer. Now moving on, I want to add on to what you said about some things. You mentioned that there is a descending line from Measures 72-75 that implies a relaxation of tension/coming down off of an anxiety. The same descending line can also be found at the beginning (intro), where if you look at the bass lines, the chords follow a pattern of descent (even though I didn't show it unfortunately). In addition in providing relaxation of tension, his descent makes me form an image of carrying the boat down (maybe from the cliff where the girls are singing XD) onto the water before starting paddling represented by the iconic eight-notes rhythm throughout the song. Also, I wanted to emphasize the motifs of echoes that is used also by Kajiura throughout the song. One example is in measures 76-78, where the rhythm set out by the F E D in M76 is carried on and finally becomes the melody which the singers sing. It probably is not very noticeable, but on some occasions I added in "echoes" such as in M19, M23, M113-4, and M119, where my left hand copies the rhythm of my right hand and vice versa. I think that this motif really ties into the image of ripples being echoed across the boundless ocean and also the lyrics below. However small our paddles/actions may be, their ripples will be carried out into the ocean; and despite their tracks inevitably being swallowed by the water, their disappearing effect will surely reach you - is what I felt after reading the lyrics. yes they are used everywhere but my main point was how the song didn't fully modulate into E major, but rather dances around it and dips into it a lot. While the topic may seem complicated, its more or less boils down to the various ways composers have to paint their musical ideas using well established techniques, much like a painter uses symbolism and perspectives and motifs and angles. I am glad you have taken up and further even my long-winded analysis done in the wee hours with little sleep, on a whim. I can definitely connect you with some of the other analyses I've done, especially in concert with Ari on here (https://forum.canta-per-me.net/members/ari.20754/), who has also done some piano arrangements which we discussed at length. You brought up the Measure 72 down-ward phrase in the intro bass line, good observation, I knew it was quoted somewhere but forgot where. I guess in a way that bass part is like a premonition, which later rises to the upper register as it comes to prominence at 72, swelling out like a wave, maybe like the tide. Yes the 'sighing-like' feeling of that motif also feels like they're coming down from something, maybe down from their initial anxieties. In the language of 16th century music in Europe this downward progression is referred to as 'word painting', so maybe it also depicts the descent of dawn into day, the song starts with mentioning "unreliable radiance" and the "new morning begins"
The 8-note rhythm representing the steady paddling, and maybe the deliberate/steady pace of movement is something I didn't notice. Maybe its like a march, they often begin at dawn as well. I did notice your echoes, now that I notice how natural they are I hardly noticed the difference between the original and your version, thats a good musical sense you have. I def. agree with your take on it - the song is all about handing-off, which includes the melodies which while simplistic are cleverly related and re-purposed, and rippling out from the start to the end, and ends with a sort of calm tranquility, like they've reached the place where their echo will reach. Lots of Kajiura songs are deceptively simple in form and style, but are hiding depth through the colorations of wordage mixed with the intuitive use of harmony/melody which pleases both the more casual listener and the analytical freaks like ourselves.